Most people trading yesterday may have noticed any number of market irregularities occurring in GOOG, ROG, GE or other stocks about five minutes before the close. 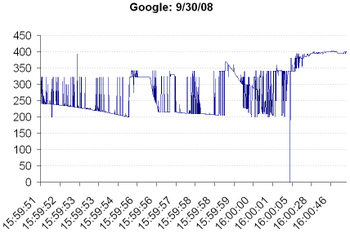 Take a look at the tic-by-tic chart of Google shown below. We are only able to highlight one minute of trading, but in the last three minutes of the trading day GOOG ticked as low as $0.01 and as high as $500. The chart above represents about 1500 trades or about 1.6mln shares, all of which were busted. The NASDAQ issued a press release saying that any GOOG shares traded below $400.52 and above $425.29 between 3:57 and 4:02 would be broken (GOOG traded as high as $404 at 4:00pm). There are two significant problems with this kind of a situation. 1) Over 5000 shares traded above $400.52 at 4:00, what happens to those people who bought low and sold high? They are stuck with the sale and have to go back into the market and buy stock; probably at a higher price than they sold it. What occurred in the marketplace to drive the stock down so wildly? There were rumors of sell programs gone wrong, but are those people are forgiven and their terrible sales wiped away? 2) Google trading down $50 in the blink of an eye is not out of the realm of possibilities. On 4/18/08 the stock opened up $80. On 11/08/07 it was down $60 from high to low. 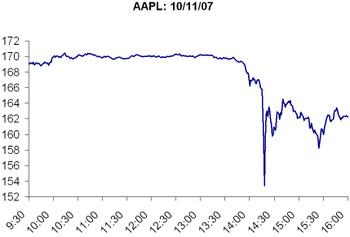 See the chart below of Apple on 10/11/07. For seemingly unknown reasons the stock traded down about -9.5%. For comparison, that would have been a decline in Google to $362 yesterday. The trades in Google were broken, the trades in Apple were not. Furthermore, these errors occuring in GOOG, GE and ROH occured on the last day of the month and the last day of the quarter. We are not sure, and there is no proof, but that does raise the question of manipulation for purposes of reporting. The other part that is very troublesome is that these examples are contained to just one or two stocks daily; what happens if someone's sell program for Dow names goes wrong?